Dining in the Rough: Jorge Fierro's Frida Bistro delivers unique Mexican flavor. A new restaurant has arrived on the west side of 700 South, near the dark end of an industrial block destined to be gentrified. But for now, the area is pretty desolate, and on a recent Friday evening, restaurant staffers were busy hanging Christmas lights in the trees outside the new eatery so as to help attract customers, who might otherwise think they’ve got the wrong address. The restaurant is Frida Bistro, named for the controversial Mexican painter Frida Kahlo. Like Kahlo’s life and work, her namesake bistro is vibrant, decorated from a bright and lively palate and strewn with evocative art. The art—paintings, Mexican masks, figurines and such—has been collected by Frida Bistro owner Jorge Fierro. If that name sounds familiar, it should. Fierro is the founder and owner of Rico brand Mexican products. Fierro’s back story is a fascinating one. He crossed the border from Mexico and came to Utah, only to discover that the refried beans for sale here pretty much sucked. So, he decided to make his own home-style frijoles and sell them. That immigrant bean seller eventually became the owner of Rico and, now, Frida Bistro. If not a rags to riches story, it’s at least a rags to restaurateur story. Does Salt Lake City really need another Mexican restaurant? Maybe not. 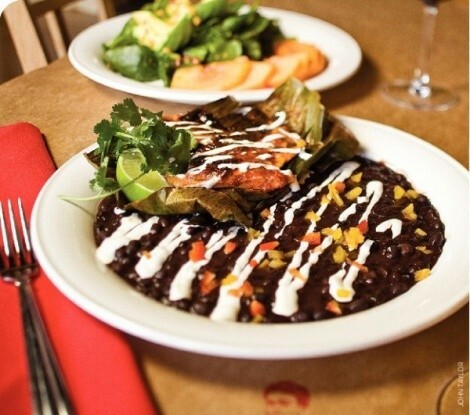 But, like the painter it’s named for, Frida Bistro is far from typical. There are no taco/burrito/enchilada combo plates on the menu, nor the ubiquitous chile verde or chimichanga. Frida Bistro is a salute to the more refined cuisines of Mexico and so, for example, at lunch time you’ll find dishes such as pollo asado ($9): Yucatan-style chicken stuffed with poblano chiles, black beans and queso fresca, wrapped in a banana leaf and served with a slightly sweet, fruity sauce. Other lunch offerings include a simple but sensational papaya and avocado salad ($8), and ceviche: shrimp, fish, scallops or a combination of all three, served with Rico’s popular blue corn tortilla chips. Putting a nouveau spin on the traditional quesadilla, at Frida Bistro it’s a cilantro-serrano flour tortilla with goat cheese and Pioneer Valley raspberry-jalapeño jam. At dinnertime, things get even more interesting. For starters, the already vivid artwork at Frida Bistro seems to come alive under nighttime lighting. And the entradas (entrees) are complex and provocative. Michoacán-style carnitas de puerco ($21) is pork leg in a sweet and tangy citrus glaze and comes with chipotle mashed potatoes, salsas and handmade corn tortillas. Camarones Diego—named, I presume, for Frida Kahlo’s husband, fellow artist Diego Rivera—is about a half-dozen butterflied, fried large shrimp served atop vivid green, grilled nopales (the pad segments of prickly pear cactus) and topped with a zippy, pumpkin-colored smoked jalapeño and Manchego cheese sauce ($25). Fair warning, however: This dish was muy caliente! Servers at Frida Bistro might be advised to prep customers for this dish’s spiciness; it’s not for the timid. A more sedate offering is almond-crusted Morgan Valley lamb chops with tropical fruit salsa and tres verdes rice ($27). One of the most elegant, complex, visually beautiful and delectable dishes I’ve ever encountered is chiles en nogada (chiles in walnut sauce). I was introduced to the wonderful flavors of chiles en nogada at a family dinner in Puebla, Mexico, where the dish originated. It’s worthy of a Michelin three-star restaurant in Paris. And, to my delight, it’s on the dinner menu at Frida Bistro, meaning I don’t have to spend hours making it at home anymore. Basically, chiles en nogada is a large, fresh chile stuffed with a complex mixture called picadillo, then bathed in a walnut-cream sauce and sprinkled with pomegranate seeds. It’s a special-occasion dish usually served in the fall, according to Jorge Fierro, when pomegranates are in season. It’s more than coincidental that the dominant colors of chiles en nogada—green, red and white— are the colors of the Mexican flag. At Frida Bistro, chiles en nogada ($25) is a single, roasted poblano chile stuffed with picadillo: ground grass-fed, organic Utah beef, mixed with fruit and nuts and topped with a creamy walnut sauce, pomegranate seeds and chopped walnuts. I don’t know all of the ingredients used in Frida Bistro’s picadillo, but my home recipe includes ground pork, ground beef, raisins, pineapple, pear, cinnamon, almonds, cloves, peppercorns, cayenne pepper, tomatoes and a dozen or so other ingredients I don’t remember offhand. Like I said, this is a complex dish. The result is a wonderful fusion of sweet and savory, a spicy mélange that pleases the palate like few foods I can think of. Unfortunately, my chiles en nogada at Frida Bistro was tepid, only slightly above room temperature, thereby marring an otherwise stupendous dinner entree. The small but interesting wine list at Frida Bistro mostly highlights wines from South America and Spain, and I’m told that Mexican wines are on the way, along with a selection of mescals from Mexico. However, there’s some tweaking needed: The bottle of Bodegas Viña Godeval ($45) from Spain we ordered arrived ice cold. It took a good halfhour to warm up to a drinkable temperature. And, service at Frida Bistro can be spotty. It ranges from excellent to acceptable. But maybe the big question mark surrounding Frida Bistro is the neighborhood. It’ll be interesting to see if people are willing to travel off the beaten path to a slightly dodgy part of town to pay $21-$27 for dinner entrees. I hope so, but we’ll see.